Birds are awesome. I mean that well beyond the slang sense — birds fill me with awe. I wasn’t one of those people who grew up knowing what they wanted to be, and my first round of college didn’t narrow that down much. But when I decided to return to school to study natural resources, I took an ornithology course. My first experiences with birding immediately hooked me. My mind was blown on a regular basis that semester. I identified my first dickcissel, learned the “wichity wichity” call of a common yellowthroat, and held my breath as my professor gently handed me a brilliantly blue male indigo bunting to hold when we learned how to mist-net birds. I had finally found a topic full of variety, with fun and exciting information to share with others. Birds are a true phenomenon. They are the most easily observed wildlife and are found in all corners of the world — urban or rural, on the tops of mountains and in caves, over land and sea. They fly, walk, swim, and hop. They nest in cavities, on steep cliffs, in the slightest depressions of earth, on the ground, in shrubs, and high up in trees. They eat nectar, plants, insects, berries, nuts, dead things, and meat — some even eat other birds! Their vibrant colors and diverse life strategies fill us with wonder, tease our scientific interests, and prod our competitive nature to see new species and add them to our life lists. Not a birder? If you know what a cardinal or a blue jay looks like, then you’ve birded. That’s all birding is, identifying birds by sight or sound. If you’ve never thought of birding as a fun or adventurous activity, I suggest you give it a try. With little more than a pair of binoculars and a field guide, you can start a hobby that will last a lifetime and continually pique your interest. No two birding trips are ever the same, especially during spring and fall migrations or while traveling — these provide a whole new set of birds to identify. With a few simple pointers about equipment and ways to get started, I hope that you, too, can have a mindblowing and birdy new hobby. Birding is more enjoyable when you can see the birds well. Looking for and enjoying birds requires little equipment, but binoculars are essential. Identifying birds byear alone is great fun, but if you’re a beginner, it’s helpful to start by locating birds in your binoculars and familiarizing yourself with their field markings and behaviors. Multicolored and heavily patterned birds like warblers and sparrows are small and can be tricky to identify if you do not know their songs or calls. The colored cap of a sparrow or the bold eyestripe of a wren can reveal the difference between these two similar-looking species. Which kind should I buy? There are many options available when purchasing binoculars, including a variety of brands, magnifications, and prices. Magnification. A common magnification for birding binoculars is 8x42. The first number describes the magnification, while the larger number describes the size of the objective lens, which is the lens at the end of the binoculars farthest from your eyes when looking through binoculars. Size 42 objective lenses capture more light and work better in low light situations. Smaller, mid-weight, and more compact binoculars work well for backpacking or travel, but if you want small binoculars, you’ll want a higher-quality brand to guarantee quality and avoid eyestrain. Cost. Binoculars range in price from about $25 to thousands, depending on brand and quality. As with most products, you don’t want the cheapest kind you can find, because you’ll get what you pay for. While birding, you look through binoculars often. Cheap binoculars can easily cause eyestrain, and this annoyance can quickly zap all excitement. A relatively affordable pair of binoculars with a fault-free lifetime warranty will run you $200-$300. This is pricey, but binoculars are an investment. If you plan on spending any time learning to bird, or you enjoy viewing other wildlife, binoculars are really fun to have in the outdoors. A trusty bird field guide is also a must. All experienced birders have a torn and battered, well-traveled, and coffee-stained old bird guide. Again, there are choices to make. Some birders prefer field guides with photographs, while others like illustrations — and most feel strongly about their preference. If you don’t want to invest in multiple guides to try in the field, check out a few from your local library and see which works best for you. I recommend field guides that cover a wide geographic range, like the eastern United States or North America, instead of guides with a handful of the “most common” birds. These rarely help you identify birds outside of your backyard and do not account for many migrant birds that pass through on their way north or south. I love holding my own trusty coffee-stained bird book and flipping through the pages. But if you prefer to travel light and enjoy technology, as a growing number of birders do, you can download a bird identification application, or app, on your mobile device. Some believe that technology removes people from nature, but bird identification apps are a portable and handy reference in the field and a great education tool. Apps are also updated with more regularity than is possible with books. Apps usually include birds’ song and call notes, which is another aspect of bird identification that books can only describe. I continue to familiarize myself with the different families of birds by thumbing through my bird book, and that is a bit more cumbersome in an app. But my beat-up bird book doesn’t sing to me with the touch of a finger, which is one of a birding app’s coolest features. A few free birding apps exist for download, including Merlin Bird ID by the Cornell Lab of Ornithology, but most high-quality apps cost a fee so that creators can be competitive with book guides — they are providing a lot of information, after all. If you’ve never birded, a great first step is to put up a bird feeder in your yard where you can see it from a window. Try identifying the birds that visit. It may take a few weeks for birds to find your feeder, so don’t become discouraged if you don’t see many right away. Once they catch on, birds will generally sit on a feeder or visit over and over, giving you ample time to look at their markings and size to identify them. fruit like oranges or apples will attract orioles when they are in Missouri in the spring and summer, and, of course, sugar-water feeders attract the buzzing activity of ruby-throated hummingbirds (Tip: You don’t need to color the sugar water red; hummingbirds will find and visit a feeder with clear sugar water). Identifying birds can be overwhelming, especially with nearly 400 different bird species recorded in Missouri. One way to begin is to take mental or written notes about the color of a bird’s various body parts, or field markings, and then use your field guide to identify it. 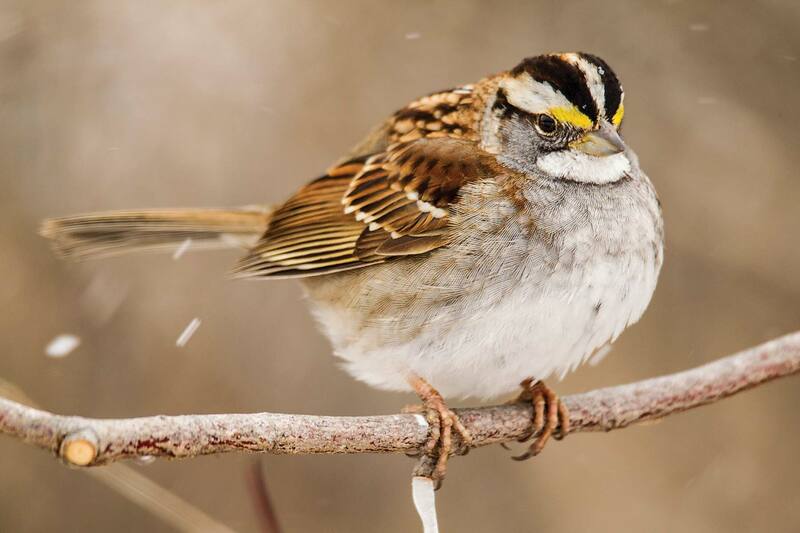 For example, if I take a winter hike and happen upon the aptly named male white-throated sparrow, I would describe it as having yellow in front of the eye, white and black stripes on the head, and a white throat. I would also make note of the bird’s behavior. If it is foraging on the ground or seen near the ground in a bush or thicket, this can sometimes help you identify the bird as a sparrow. Similarly, if I saw a male common yellowthroat perched in a field in June, I would describe it as having a black mask bordered with white on top and a yellow throat and underside. Practice picking out key colors and unique features of the birds that you see. This practice not only applies to songbirds but also is useful for waterfowl, hawks, shorebirds, and others that are tough to differentiate. Field markings are just one way to identify birds. Spend time learning how your field guide works. Read its introductory pages that describe range maps, body shape, flight patterns, and habitats of each bird. All of these facts help you to piece together the clues and narrow your search. Remember that the best birders did not learn their birding tricks by staying indoors. Years of practice in the field helped them hone their skills. Get outside and visit a conservation area near you. Some of Missouri’s most diverse birding spots are Department-managed public lands. Visit the Conservation Department’s Conservation Area Atlas at mdc.mo.gov/atlas to find a nearby conservation area or nature center. The best way to learn your birds in the field is to find experienced birders and go on birding field trips in your area. A mentor or birding group will provide helpful tips and years of experience and bird knowledge that you won’t find in a book or app. Most birding groups are happy to see fresh faces joining the hobby. Visit the Audubon Society of Missouri website at mobirds.org to find birding resources, view a calendar of birding events, improve birding skills, and become a member of the society. Missouri chapters of the National Audubon Society also can be found by visiting audubon.org/chapters?state=MO. Your local Conservation Department nature center also may have birding programs that allow you to practice your identification skills outdoors with a knowledgeable naturalist. Visit mdc.mo.gov/node/4439 for a list of Missouri’s nature and interpretive centers. My favorite part about birding is the realization that birds are all around us. When I began my first field job searching for Acadian flycatcher nests at Whetstone and Rudolf Bennitt conservation areas to monitor their survival (yes, there are jobs like this! ), I felt like a mere speck in the forest. I was just passing through while thousands of birds worked tirelessly for the opportunity to pass on their genes. They were gathering grass or sticks to build nests, silently hunkering down and incubating eggs, and making nonstop trips back and forth to feed tiny, gaping beaks. Birding makes me feel like part of something bigger that is unseen and moves all around us. My birding experience is a blink compared to that of many widely traveled and field-hardened birders across the state. But the diversity of birds, their beauty in sight and sound, and their varied life strategies and adaptations have continued to hold my interest like nothing else. So grab your field guide and binoculars and take flight! You’re in for a tweet. Many folks find it difficult to find their target (birds or other wildlife) through a pair of binoculars for the first time and get frustrated. Use this simple rule when using binoculars, and you’ll find what you’re looking for. Look at your target (a bird or other wildlife) and do not take your eyes off of it. Bring the binoculars up to your face without taking your eyes off of the bird. This guarantees that the binoculars will be pointed at the target. Do not bring the binoculars up to your face and then move your head around to relocate the target. You can buy or build your own bird feeder. Woodworking is a fun activity solo or in a group and a great way to teach children the importance of helping out the critters on your property. Visit mdc.mo.gov/node/4955 for plans and a video on how to make two different kinds of feeders. Look through the Conservation Department’s birding Web pages at mdc.mo.gov/node/235 for more bird resources, including birding hotspots, bird behavior, and identification tips. Once you begin having success with bird identification, start a life list. A life list can be a great memento of all of your birding trips, and now it can feed science. eBird (ebird.org) is an online, real-time bird listing website that allows users to store their life lists. You can choose to allow your lists, which are checked by a committee for accuracy, to be used as part of a worldwide effort to monitor bird populations. One great feature is the occurrence maps available at ebird.org/content/ebird/occurrence. These maps were created using eBird data from birders just like you to illustrate migration patterns of a variety of birds across the lower 48 states in a given year. White-crowned sparrows and northern cardinals are common backyard birds in Missouri.